My name is Lt. Aldo Raine and I’m putting together a special team … Through our cruelty they will know who we are. And they will find the evidence of our cruelty in the disemboweled, dismembered, and disfigured bodies of their brothers we leave behind us. And [they] won’t be able to help themselves but to imagine the cruelty their brothers endured at our hands, and our boot heels, and the edge of our knives. And [they] will be sickened by us, and [they] will talk about us, and [they] will fear us. And when [they] close their eyes at night and they’re tortured by their subconscious for the evil they have done, it will be with thoughts of us they are tortured with. Sound good? Those that know me can probably tell you that nothing is more frustrating to me than not being able to hit all my colors and cast all my spells. I am generally a fan of consistency over power. Even in a Standard format with as much fixing as is currently available, I hesitate to play a three color deck. That said, I’m pretty sure that playing a U/W control deck in this format requires at least a splash of some kind, be it red for Pillar of Flame (as seen in week one from Todd Anderson), green for Thragtusk and Farseek (like the Bant control deck suggested by Chapin), or black for access to Ultimate Price, Lingering Souls, and Sorin (such as the deck that Shaheen Soorani piloted to win Virginia States). Clearly there are several ways to bastardize the Azorius deck, and personally I’ve run the gamut. I think splashing for Pillar early on was correct—even necessary, considering the saturation of Zombies that was expected. However, the majority of the Zombie population has since died out (“died out again?”), and if you’re going to go with red, I think the midrange/tempo strategies are probably a better fit. The format-defining beast that is Thragtusk, plus the addition of a “Mind Stone” in Farseek was very enticing, but the need to hit green mana on turn two to get the most out of Farseek (i.e. 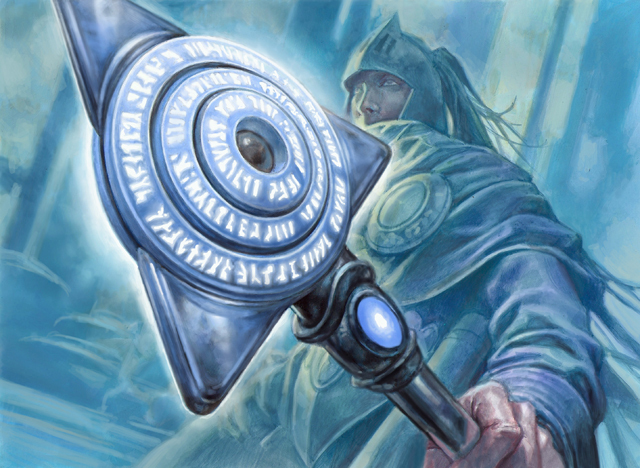 resolve Jace, Architect of Thought on turn three) required more than just a splash of green. In addition, playing Thragtusk in a white deck just begs for the inclusion of Restoration Angel (and to a slightly lesser extent, Angel of Serenity), which also plays nicely with cards like Centaur Healer. All of a sudden, instead of an Azorius control deck splashing green, you’re playing a Selesnya creature deck splashing blue. While both Bant Control and U/W/R Midrange are strong and valid strategies, neither is really my style. These lists are obviously very similar to each other; more than living in the same neighborhood, I think they share a three-bedroom apartment. I like a lot of Shaheen’s numbers, but I don’t really want to play with Runechanter’s Pike. It’s too much of a threat and not enough of an answer. 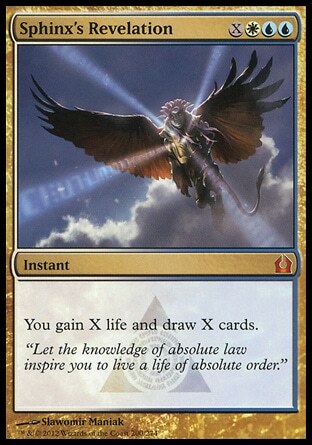 I like my cards to either be able to get me out of a bad situation (spot removal, counterspells, sweepers, card draw) or ideally double as both threat and answer (Lingering Souls, planeswalkers). It’s just a one-of in Shaheen’s deck, and I certainly can’t fault him for playing it—he did win VA States, after all—but equipment is not where I want to be. I also decided to cut the Augurs, which I don’t feel are as good with so few zombies around to scare off (not to mention how demoralizing it is to whiff, even if it’s rare). Despite my initial reservations, Sorin has really been pulling his weight. The comparisons to Elspeth, Knight-Errant are inevitable, yet fairly warranted in the context of this deck. 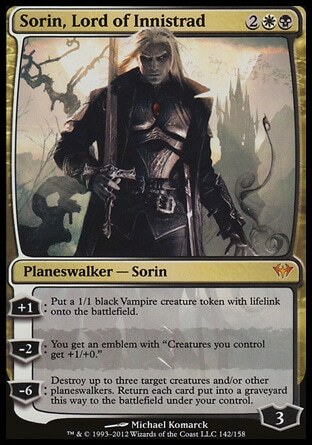 In most cases I find myself making a Soldier Vampire token to defend myself and my planeswalkers, and in this way Sorin is better than Elspeth (lifelink!). Sorin also threatens to go ultimate a turn faster. While his second ability is clearly weaker in the sense that it costs loyalty rather than adding it, the actual effect in concert with Lingering Souls can act as a pseudo-Overrun of sorts. If you’re not under a ton of pressure, it’s often correct to hold Sorin until you’re able to play Lingering Souls and flash it back in the same turn; then play Sorin on the subsequent turn, make an emblem, and crash in for 8. Azorius Charm is another card that has surprised me somewhat. 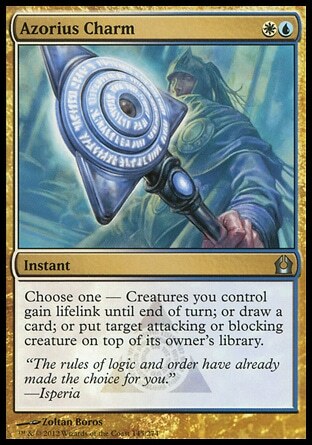 When the Return to Ravnica Charm cycle was initially spoiled, most put this one somewhere in the middle in terms of playability; however, just the “Condemnory Lapse” mode (as I like to call it) makes the card worth playing. That you can “cycle” it is just icing, and the third option is like remembering to grab a napkin. I always forget to grab napkins, but often find myself in situations where I wish I had one handy. If you haven’t played a Sphinx’s Revelation yet, you’re missing out. The card is really good. I’ve mostly cast it for the lifegain and ended up with 4+ cards as a bonus. It’s like paying a lot of money for a good meal at a nice restaurant, and being given a free iPad on the way out. I’m still fiddling around with the manabase, primarily the numbers on the utility lands. Currently I’ve got two Nephalia Drownyard, one Vault of the Archangel. I don’t want more than three in the maindeck, and I’m considering cutting one of them for either a Swamp or an Evolving Wilds. With only four counterspells main, this deck isn’t extremely vulnerable to Cavern of Souls, but a Cavern could still hurt. Ghost Quarter may be worth consideration, if only for the sideboard, with the added effect of bolstering your game against opposing Drownyards, Kessig Wolf Runs, etc. A couple of other cards I’ve got my eye on are Drogskol Reaver and Cyclonic Rift. Shaheen does a great job espousing the virtues of Reaver in his article, so I won’t rehash that here. 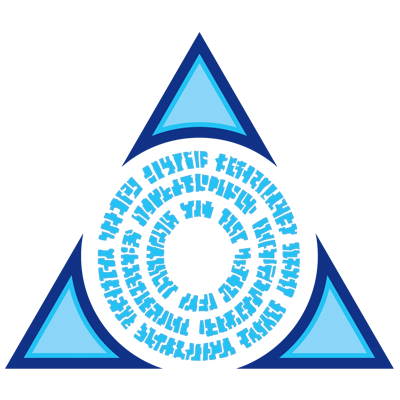 Rift just seems like an excellent catchall that can double as an additional sweeper—an incredibly powerful, lopsided sweeper at that. SCG’s own Glenn Jones once referred to Sleep as “the blue Bonfire,” and I think Cyclonic Rift is an even better fit for the moniker. I’m seriously considering it for a slot in the maindeck, but it’s a tough call on what to cut. No sideboard as of right now, as I’m still tweaking the maindeck, and I’m also of the opinion that sideboarding should be tailored to each specific tournament. I will say that in the wake of Brad LeBouef’s win last weekend in New Orleans with three maindeck Cavern of Souls, the Essence Scatters that I was considering are looking a lot worse. It seems to me that you’re better off dealing with creatures using removal and sweepers than by trying to rely on narrow counterspells. For the moment, this is my favorite deck in Standard, and it has a lot of wiggle room and potential to evolve with the format. Not only that, but Gatecrash will be sneaking up on us in just a few months, bringing with it Watery Grave, Godless Shrine, and likely a host of Dimir and Orzhov goodies that will only make the deck stronger.